From the architect. The Skidmore Owings & Merrill LLP (SOM)-designed Zhengzhou Greenland Plaza has opened its doors to its office users. 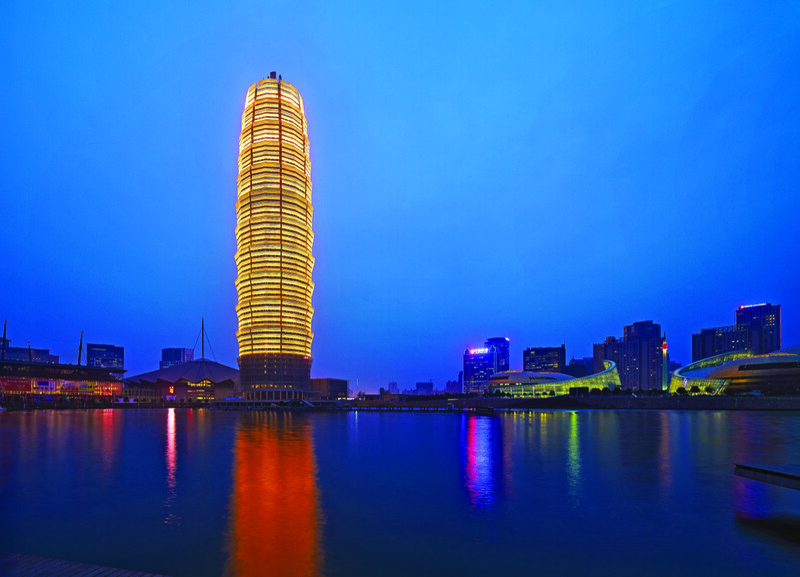 The circular 60-story tower takes its place as the tallest building in the central Chinese city. 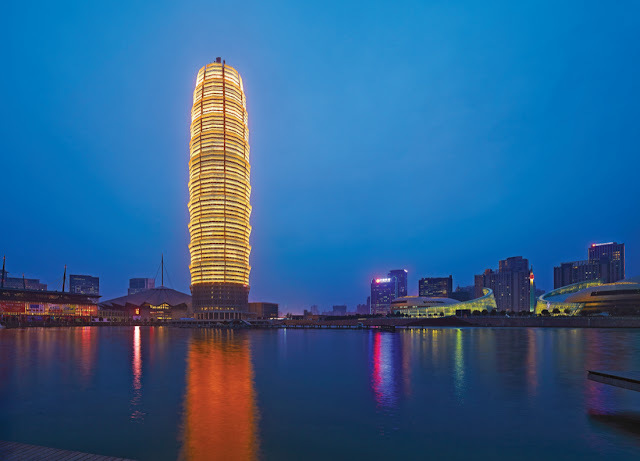 Located in the northeast portion of Zhengzhou, the 919-feet (280-meter) tall tower’s circular form is a response to the surrounding development’s shape that centers on a manmade lake. Zhengzhou Greenland Plaza punctuates the neighborhood and provides the area—and the city—with an iconic new landmark on the skyline. The 2.59-million-square-feet (240,169-square-meters) building houses a mixed-use program of offices on its lower floors and a 416-key hotel above. Daylighting was a key driver of the building’s design. Sophisticated three- to five-story-tall light-gauge painted aluminum screens are configured at an outward cant that enhances interior daylighting through scientifically calculated reflections while protecting the all-glass exterior from solar gain. The screens provide multiple performance and aesthetic-related roles. The same outward cant that aids daylighting allows for a nuanced approach to artificial lighting, providing outboard locations for dramatic nighttime lighting of the building that make the tower a beacon. The screens are located between one and two-meters from the building’s curtain wall—allowing window washing to occur behind the screens. Their visual porosity varies depending on a viewer’s location. When close to the building’s base, the tower appears to be primarily metal; from a distance, the panels are more open and the building’s glass nature is revealed. The rhythmic cant of the screens, combined with their decreasing size as they rise on the building, creates a dynamic movement that gives the building a fine-grained texture that relates to the building’s humanistic aspirations. The form of the tower tapers slightly as it rises. “We conceived the building as a classical column,” SOM Design Director Ross Wimer says. “Its iconic image comes from this timeless form—adapted with cutting-edge, 21st century technologies to create a building that expresses our time.” These innovations include a heliostat that crowns the building and reflects daylight throughout the hotel atrium. “Like the solar screening, the heliostat is a scientifically-derived element that enhances the experience of daylight for the building’s users,” Wimer says. The device allows daylight to be reflected and focused into the atrium whose surfaces are finished to help drive light deep into the space. Computer-controlled dimmer switches modulate the light level-based on the illumination provided by the reflector, enabling the atrium to consume less energy and generate less heat throughout the year. 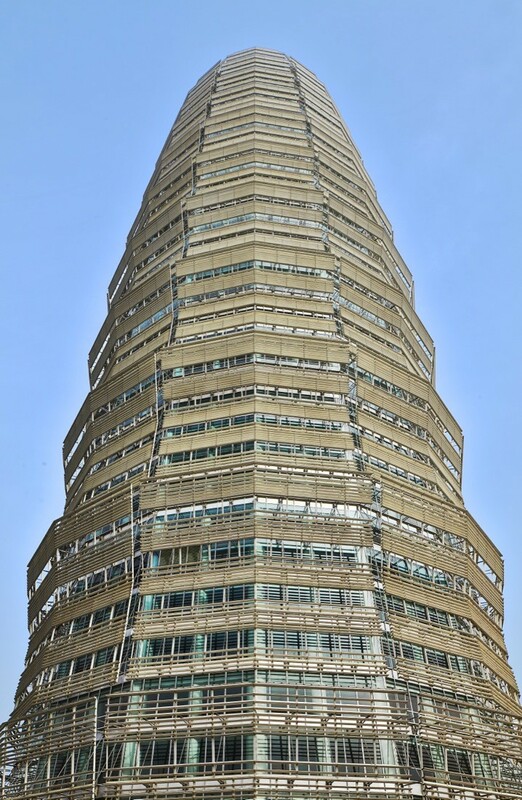 Wimer notes that, while not unheard of, circular skyscrapers remain somewhat unusual. Among the best known examples are Bertrand Goldberg’s Marina City (179 meters) in Chicago, Sir Norman Foster’s 30 St. Mary Axe (180 meters) in London, Jean Nouvel’s Torre Agbar (145 meters) in Barcelona, and Adolf Loos’ unbuilt scheme for the Chicago Tribune Tower. 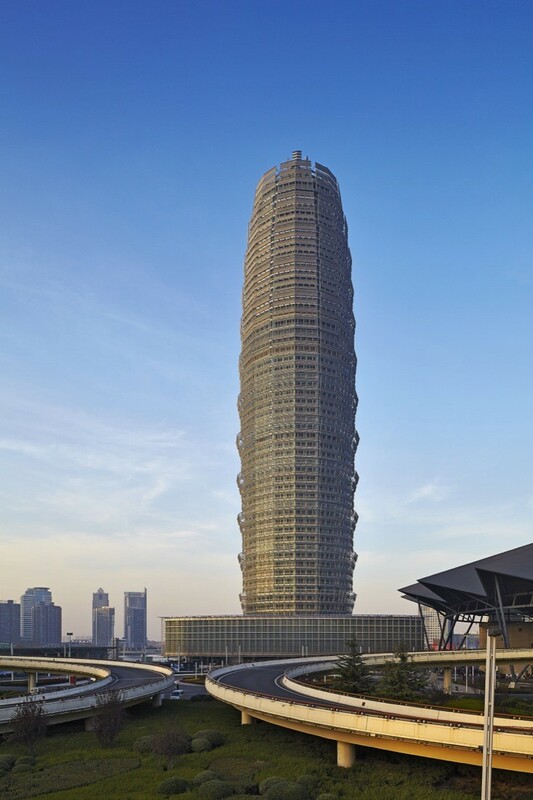 Zhengzhou Greenland Plaza’s status as the tallest building in the city adds to SOM’s well-established legacy of tall buildings. SOM-designed buildings top the skylines of many cities worldwide, including Chicago, New York, Beijing, Kuwait City, Milwaukee, and Dubai—whose Burj Khalifa is the tallest structure in the world. 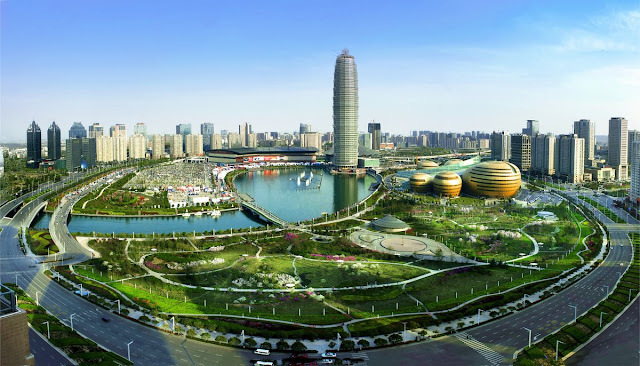 Zhengzhou is a prefecture-level city located on the south bank of the Yellow River and the capital of Henan province with 8.6 million residents. Greater Zhengzhou was recently named one of China’s 13 emerging megacities by the Economist Intelligence Unit. SOM secured the commission for the project by winning an international competition. Prior to its completion, Zhengzhou Greenland Plaza has already been honored for its design by the Asia Pacific Property Awards and the Chicago Athenaeum. Its innovative curtain wall was recognized by Architect magazine’s R+D Awards program. Zhengzhou Greenland Plaza is built with the latest technology available today and yet it resembles the ancient pagodas of China. Its form is truly inspired by China's long history of culture and architecture. The influence of Chinese architecture may not be admitted by the architect but the end result is too obvious for one to ignore its resemblance to ancient icons all over China. The site is simply picturesque thanks to the central lake that seems to bring all the buildings towards it. This type of design planning with architecture and landscape complementing each other can easily be traced back to the ancient gardens and parks all around China.